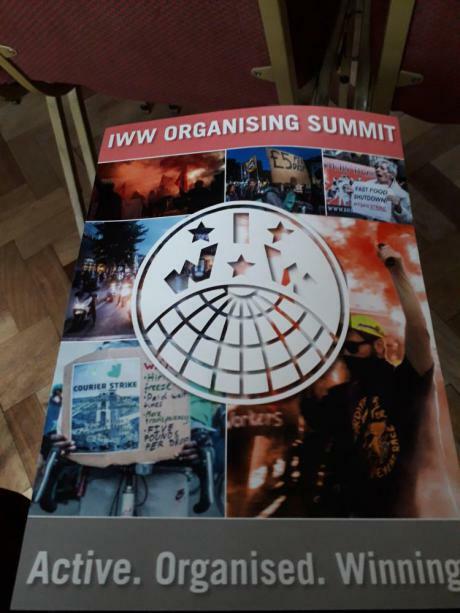 On Saturday October 20th over 60 IWW members from all around the UK and Ireland gathered for the annual Organising Summit held this year in Sheffield. The day started with a keynote session delivered by Bob Jeffery, Chair of Sheffield TUC who described their “Sheffield Needs a Payrise” campaign and was followed by a robust discussion where IWW Members present discussed the campaign and the implications for our own organising. Following the keynote, the day began in earnest with a number of sessions running during the day including sessions from the IWW Couriers Network and ongoing campaigns in Logistics and Carework. There were also sessions on dual carding strategy, increasing participation on IWW organising campaigns, organising tactics under the new strike laws. Each year the Organising Summit grows from strength to strength and this years was no exception – roll on 2019! A more detailed review of some of the sessions from the day can be viewed on libcom.org here.